UrbanCincy: OTR Neighborhood Holiday Party - Thursday Night! Tis the season for holiday parties, and tonight there is a special one happening at Mr. Pitiful’s (map) on Main Street in the heart of Over-the-Rhine supporting the Over-the-Rhine Foundation. 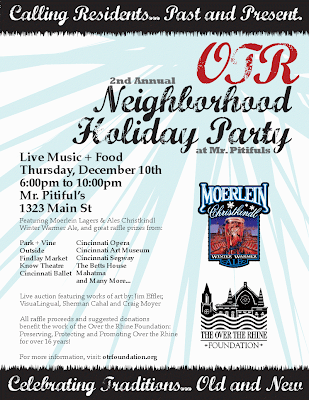 The 2nd Annual OTR Neighborhood Holiday Party will feature live music from local favorites Messerly & Ewing, food, and of course spirits featuring Christian Moerlein's Christkindl Winter Warmer Ale. The party gets started at 6pm Thursday evening and is slated to run until 10pm, but you have to figure that will be just about the earliest anyone heads home. There will be raffle tickets available for $10 which will give you a chance to get some help out with some gifts for friends or for yourself. Prizes range from gift cards to OTR shops such as Park+Vine, Outside, Findlay Market, and tickets to productions by the Cincinnati Ballet, Know Theatre, and Cincinnati Opera. Another fundraising piece of the night will include a live auction featuring works of art by Jim Effler, VisuaLingual, Sherman Cahal, and Craig Moyer. Finally, $25 raffle tickets will be available for the Dream Vacation Raffle which is a one week stay in Cabo San Lucas, Mexico. As mentioned above all raffle proceeds will be going to the Over-the-Rhine Foundation which has been working to preserve, protect, and promote OTR for over sixteen years. So come on out, support a good cause, meet new folks, and get reacquainted with older ones at Mr. Pitiful’s on Thursday. While there is no need to RSVP per se, there is of course a Facebook Page where you can let everyone know of your good intentions! And for htose lucky enough to have tickets to Know Theater's "Sideways Stories from Wayside School" tonight, there will be dance lessons for the audience starting at 7 PM. The dance lessons sound extremely cool. I wish I could make it for that alone...the show was great. This is going to be a great event. Also I read about soapboxmedia.com is going to have a year end celebration @ Grammer's next Thursday.